Do you understand how your Accounting Policies and Procedures integrate with the accounting rules and concepts to produce the internal controls you need? How familiar are you with the accounting rules and concepts utilized by accounting systems? If you were more confident with the information generated by your accounting program, would it help you to use it more effectively to run your company? More importantly, do you understand how your Accounting Policies and Procedures integrate with the accounting rules and concepts to produce the internal controls you need? On one hand, popular accounting programs for small and mid-sized businesses have become more widely used than ever before. On the other hand, industry consolidation has significantly reduced the accounting program choices to a handful. These choices are typically inexpensive, easy to implement, and come with little support to develop appropriate accounting policies and procedures to ensure that the data generated by these programs is accurate and complete. Entry-level software like Quickbooks and mid-level software like MAS-90 or Great Plains share this common deficiency. “Support” documentation is long on the explanation of user features and short on accounting policy and procedural advice. Your Accounting manual, associated accounting procedures, and accounting documents, establishes your Accounting Management System. The system is designed to result in improving the effectiveness of your accounting operations and in your ability to satisfy auditor requirements. Maintenance of the Accounting Management System is the responsibility of the Controller/CFO in conjunction with the Accounting Department. The Controller maintains all documents that identify the sequence of accounting processes and, in conjunction with the appropriate department managers, defines the interactions of the processes within the procedures defining these processes. Processes for management activities, provision of resources, and measurement reporting are included. Accounting procedures should include the methods needed to ensure that the accountability and control of processes are effective. Top Management ensures the availability of resources to support the accounting operations and monitoring of processes through regular interaction with accounting department managers and through review activities at accounting Management Review meetings. Accounting department managers and the CFO/Controller monitor, measure, and analyze accounting processes and implement any actions necessary to achieve intended results and continual improvement of the processes. These results are monitored at Management Review meetings. Any financial processes that are outsourced that may affect your company’s conformity to requirements must also be controlled. The Controller and appropriate department manager(s) are responsible for defining the methods to control outsourced processes and procedures. Only twenty years ago, small to medium sized businesses faced daunting choices for selecting accounting systems. There were only three choices: Continue to use a full manual system (a comprehensive pegboard “one-write” system, employing many journals anchored to an imposing cloth bound general ledger book that rivaled the size of the largest Webster’s Dictionary); purchase or lease a computerized accounting system; or build your own automated system. The manual accounting systems were not trivial. They were produced by major firms, which provided on-site implementation and training. These systems were well documented with many accounting policies and procedures built into the regimented use of the “one-write” journals and corresponding ledgers. Internal controls were manual at best. An alternative decision was to purchase or lease an automated accounting system. But this required another decision of whether to buy a “ready made” product or build your own. To make this decision, the company would typically hire a consultant or CPA firm to perform a comprehensive “needs” analysis. The consultant would eventually select, either a commercially built multi-module accounting program (like Solomon, our Real World), or a programmer to develop the structure from custom code (RPG was a popular language used to create custom accounting programs). Either one of these alternatives would have to run on a leased or purchased dedicated mini-computer system, (the IBM 36 was the popular mid-size business choice for many years). Both solutions required tremendous resources in time and money. Even the “ready made” solutions required plenty of additional programming to fit it into the specific company’s needs. For a half a year or more, various consultants, programmers and specialists would write code, test and rewrite code. In either case, documentation was paramount. Hence Accounting Policies and Procedures, as they applied to the mechanics of the accounting system were well documented as a by-product of the installation and implementation process. The total costs in the purchase or lease of the hardware and software (ready made or custom built), and in the company’s own human resources, was staggering. Imagine the months of decision making preparation, the months of development, the reams of Accounting Policies and Procedures documentation, and the total costs that easily went from tens of thousands to hundreds of thousands of dollars. Compare this with current practice: The company owner (or the controller or other designee) walks into a local retailer, picks up a copy of the most successfully marketed accounting software package (i.e., the one occupying prime shelf space), drives back to the office, and loads the program on any available PC. There you have it — the decision making process, needs analysis, implementation, and installation, all for one low price — or is it? None of these accounting programs comes with supporting accounting policy and procedure documentations. Internal controls do not exist and require manual processes and extra paperwork. Your accounting software does not come with support to help in your compliance with Sarbanes Oxley. Of course you can develop your accounting policies and procedures yourself, from scratch. But, this take a lot of time and expertise. Company obligations and costs comply with applicable laws. All assets are safeguarded against waste, fraud, loss, unauthorized use, and misappropriation. Revenues and expenditures applicable to company operations are recorded and accounted for properly so that accounts and reliable financial and statistical reports may be prepared and accountability of the assets may be maintained. Programs are efficiently and effectively carried out in accordance with applicable laws and management policy. Managers of the Accounting Management System are to promptly evaluate findings and recommendations reported by auditors and then determine proper actions in response to audit findings and recommendations (e.g., develop corrective actions). Accounting Managers should complete, within established time frames, all actions that correct or otherwise resolve the matters brought to management’s attention. The audit resolution process begins when the results of an audit are reported to management, and is completed only after actions have been taken that correct identified deficiencies, produce improvements, or demonstrate the audit findings and recommendations are either invalid or do not warrant management actions. Its final classification in summary records. All transactions recorded or posted into the Accounting Management System should be properly authorized and accurately represent the activity being documented. Both the timing and amount of the transaction should be in accordance with company accounting policies. Accounting transactions and other significant events are to be authorized and executed only by persons acting within the scope of their authority. It is the principal means of assuring that only valid transactions and other events are entered into. Modification or adjustment to previously recorded transactions requires authorization. All transaction dates recorded in the company accounting system should accurately reflect the date the transaction occurred. Sales from the revenue cycle are recognized when earned and expenses when incurred. Processing, cutoff and period-end closing schedules and procedures should be documented. Cash sales should be recorded at the time of sale and deposited. Prior or related transactions should be checked for conformity with the transaction being recorded (e.g., match invoice to purchase order). Amount of posted transactions should be checked against source documents. Balances with third parties should be verified as appropriate (i.e. debtors, creditors, or custodians of investments). Transactions should be recorded in conformity with documented accounting policies. Transactions should be recorded in the accounting system accurately. An approved set of general ledger and subsidiary accounts are maintained for assets, liabilities, revenues, expenses, budgetary accounts, and other accounts. All transactions should be supported by documentary evidence, which becomes part of the accounting records. Error transactions should be reviewed, resolved, and cleared in a timely fashion. Manually determined control totals should be reconciled with recorded results. Your Accounting Management System is comprised of your Accounting manual, associated accounting procedures, and accounting documents. 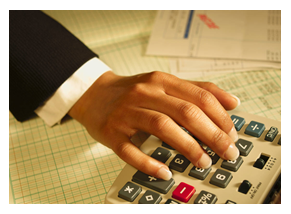 The Accounting Management System utilizes standard forms and provides control and accountability over these forms. Supervisors should review posted accounting transactions with source documents and processing documents. When organized correctly, your accounting system will result in improving the effectiveness of your accounting operations and in your ability to satisfy auditor requirements. 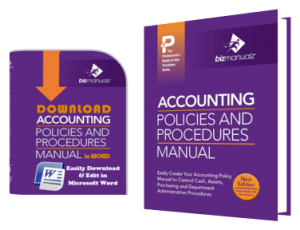 The future begins today, with your purchase of this Bizmanualz Accounting Policies, Procedures and Forms. This manual is needed more now than ever. Accounting systems are more accessible than ever before. Unfortunately, they come with no instructions. The user guide that comes with the accounting software only explains what the menu options do, it doesn’t explain which options result in sound accounting practices. Accounting software is looking more and more like your own internet browser home page, (no surprise since each manufacturer is competing to be your primary web portal). New Accounting Software as a Service (SaaS) applications will make this a reality. But, in the process, the actual functions of accounting are less obvious, and as a result, less understood. Hopefully, by understanding the concepts and consistent accounting rules utilized by all accounting software programs, you will develop more confidence to rely on the information generated by the program, you will have a deeper appreciation of the importance of accounting policies and procedures for internal control, and you will be able to use it more effectively to run your company.